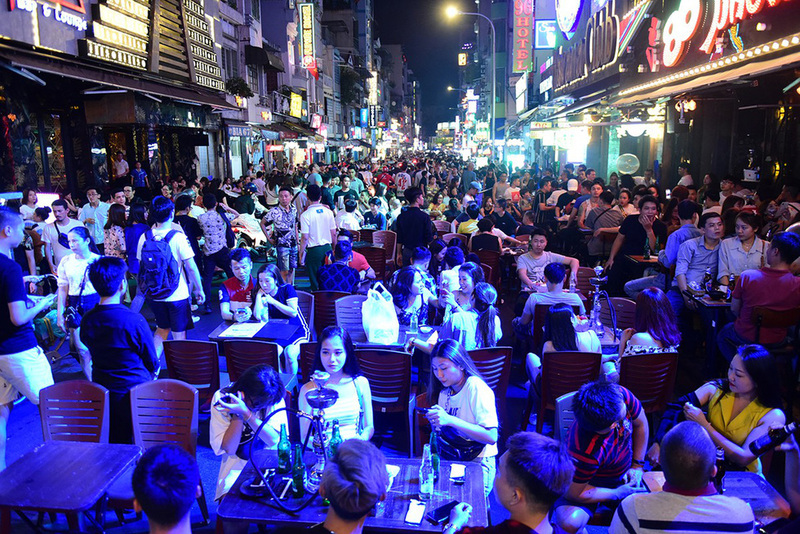 The Bui Vien Walking Street in Ho Chi Minh City’s ‘backpacker area’ is no longer reserved for pedestrians as local bars and pubs usually block most of the path by setting up their tables and chairs on the roadway. 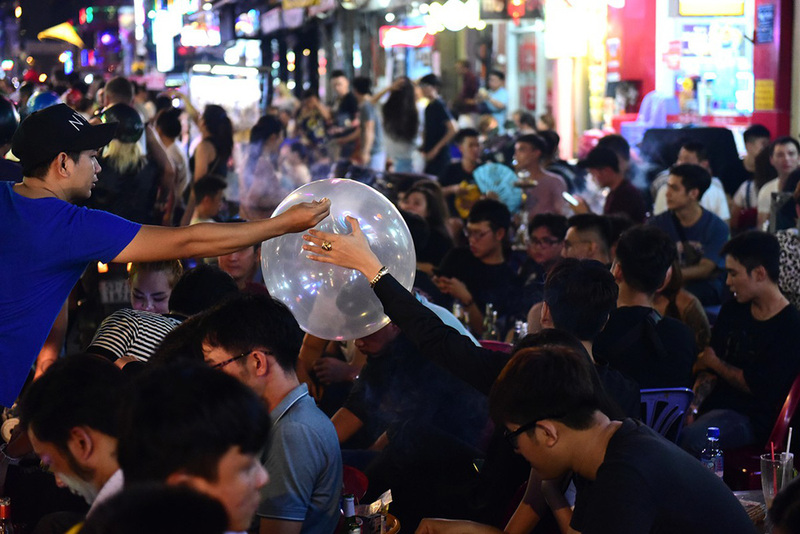 It has always been common that restaurants, beer parlors and street food stalls fill the sidewalks along Bui Vien, but the roadway, which is reserved for pedestrians on weekends, has recently been encroached on by these venues, causing immense difficulties for people to walk on the street. Bui Vien is one of several streets making up the so-called ‘backpacker area’ in Pham Ngu Lao Ward, District 1. Since August 20, 2017, the road has become a walking street from 7:00 pm to 2:00 am every Friday, Saturday, and Sunday, with vehicles being banned from entering the route. Many venues along the street have taken advantage of this and turned the public space into their business site by placing tables and chairs on the roadway. Customers sit in the middle of the road. 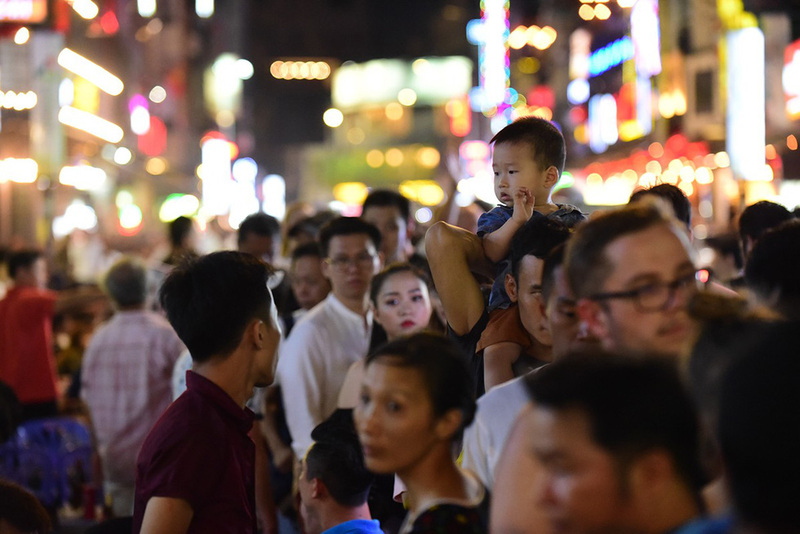 Some facilities take up two-thirds of the road, leaving little space left for pedestrians, according to the observation of Tuoi Tre (Youth) newspaper reporters. These facilities even task their employees with guarding the tables and preventing people from moving the objects. 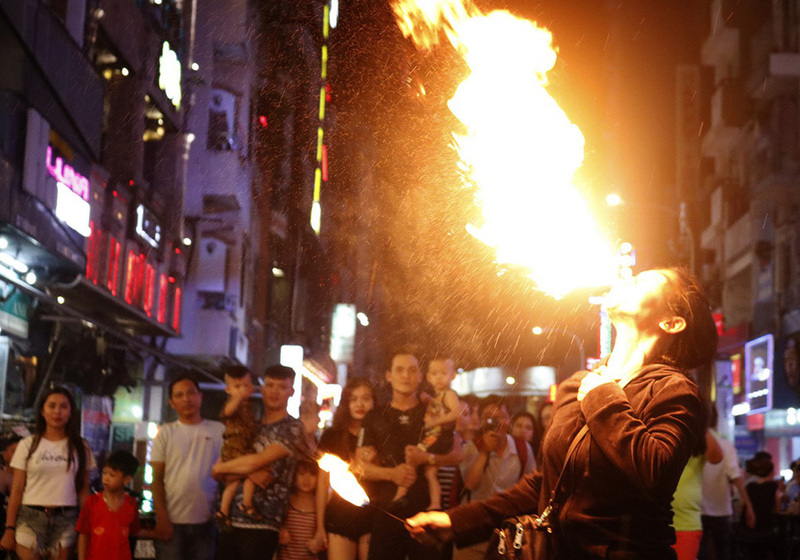 A few of them hire fire performers to attract more customers. It is now challenging to walk on Bui Vien, especially on holidays. 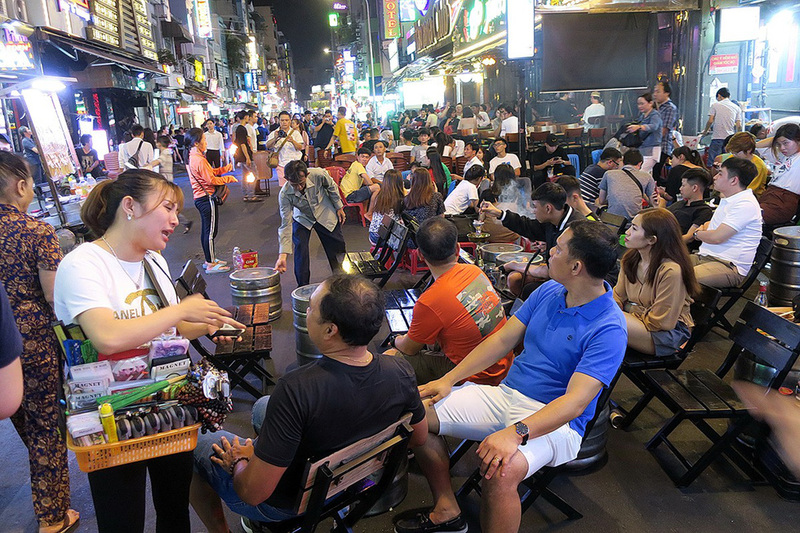 The encroachment is less serious during weekdays, when the road is open to traffic, but the situation is no less chaotic as the roadway is filled with vehicles, pedestrians, and customers of local venues. Local authorities have yet to take any firm action to deal with the issue. 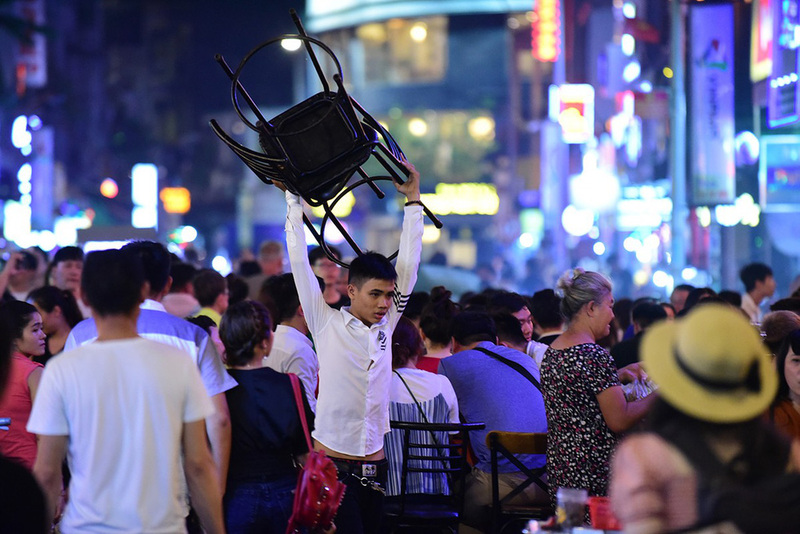 An employee carries a pair of chairs. People have a hard time walking on the pedestrian street. An employee hands a laughing gas balloon to a customer. 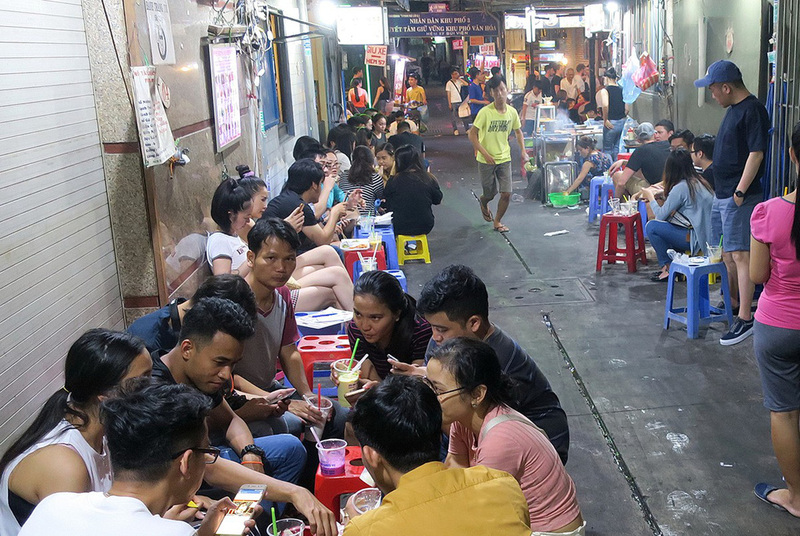 Young people enjoy street food in an alley on Bui Vien Street. 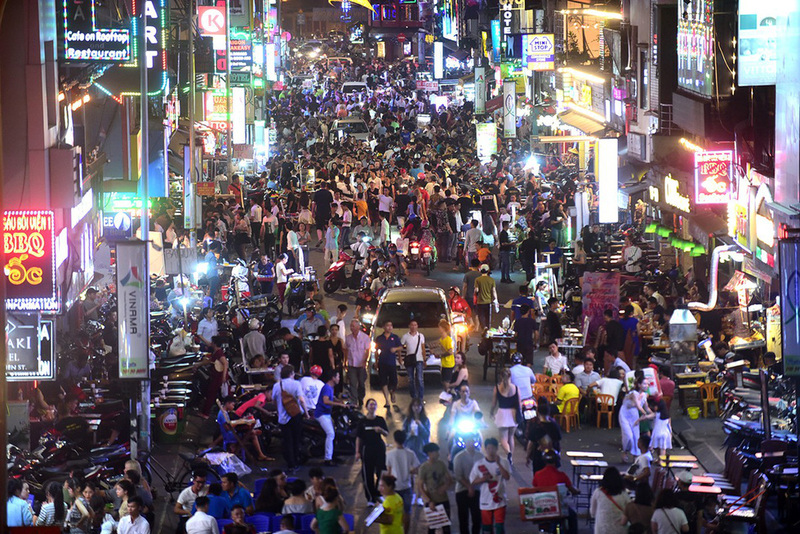 The road is filled with vehicles, pedestrians, and customers on a regular weeknight.